DJ Justin Kanoya on stage with Sheri Matthews and Mike Sherbakov as they kick off the Fitbit Local program in San Diego. Fitbit San Diego ambassadors, Mike Sherbakov and Sheri Matthews. Fitbit, essentially the biggest name in wearable fitness technology, recently kicked off a new program in San Diego titled Fitbit Local. The company, with users worldwide, is now working with select ambassadors in U.S. cities to put together a monthly program of meet-ups to get Fitbit users together to mingle, exercise and sweat. San Diego was the first stop on the Fitbit Local tour, and I had the pleasure of sharing the stage with my running coach/life coach/spin instructor and most importantly, friend, Sheri Matthews. She along with Mike Sherbakov have been designated San Diego’s Fitbit ambassadors. Mike is also a great San Diego fitness community leader and I’m so grateful to have the opportunity to work with him on this project. Sheri and Mike will be leading workouts over the next few months. For you San Diego locals, there is more information on the program website. On this day, however, they led a quick two-hour event that contained a high intensity bootcamp style workout, followed by about 45 minutes of yoga. I kept the energy levels up with fast paced arrival music and played that throughout the initial workout before slowing things down for yoga. 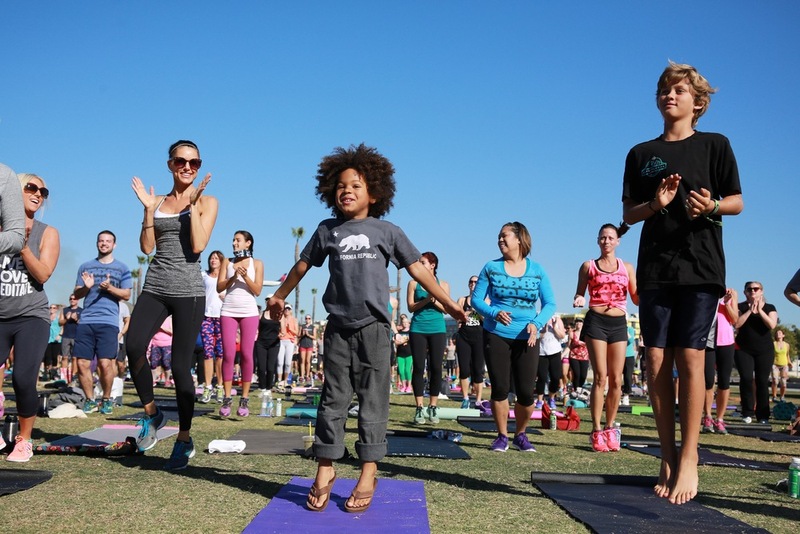 The event took place at the San Diego Waterfront Park, located on the lawn of the San Diego County building, a beautiful setting for a morning fitness/yoga DJ session. Here are a few more photos from this amazing event! All photos in this post are courtesy of Fitbit Inc.